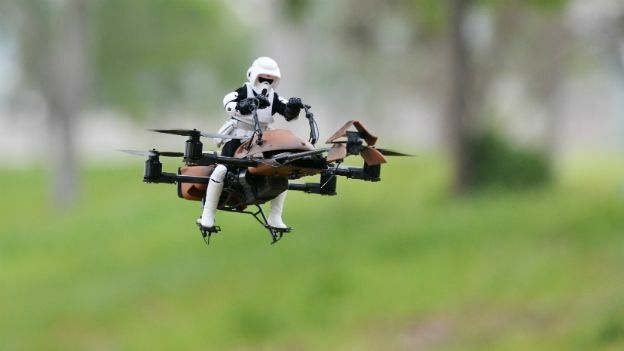 An engineer has taken his love for Star Wars to the next level by building a remote control Imperial speeder bike quadcopter. We at T3 love things out of the ordinary, and this undoubtedly qualifies. Engineer and Star Wars fan Adam Woodworth has built a custom quadcopter out of a Hasbro Imperial speeder bike toy. The Google engineer and MIT graduate has been into radio control vehicles since he was a kid and has always had a thing for Star Wars. When looking for a new project to start, he thought why not combine his two passions and bring his favourite scene (the Endor chase scene) from Star Wars: Return of the Jedi to life. He then fitted 10mm carbon tubes for booms, stick mount-stylemotormounts, angled autopilot and rotors, and control provided by a 3DRobotics PixHawk. To shed some of the weight it was carrying, Woodworth even made a lighter stormtrooper out of pipe cleaners, old Nerfdarts, and 6mmcarbon tuberuns. He also fitted the stormtrooper's helmet with a first-person video camera mounted to a Styrofoam ball, so he could see what it was like from the toy's point of view. The result is awesome. We want one and you certainly will too. Check out the video below and let us know your thoughts in the comments.